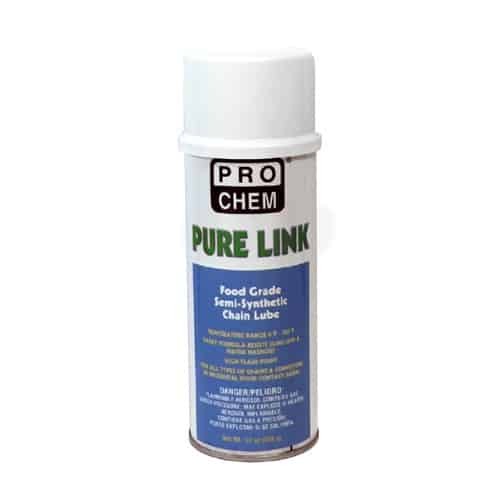 PURE LINK | Pro Chem, Inc. PURE LINK has a unique blend of synthetic lubricants and mineral oil that quickly penetrates, lubricates and protects the roller drive and conveyor chains. Penetrating foam reaches deep to reduce friction and wear on chains and conveyors. Safe to use in areas with incidental food contact and around food processing areas. Shake well. Remove protective cap and point spray opening in desired direction. Holding container 6-12 inches from surface to be treated, spray product liberally, saturating parts. For extremely difficult jobs, saturate and allow to set 5-10 minutes. Repeat periodically.